Most airlines will serve champagne in international business and first class and some airlines have been investing heavily in the champagne experience their passengers can expect on board. The quality (and price) of the champagne served is usually significantly better in first class than business class, as you might expect. 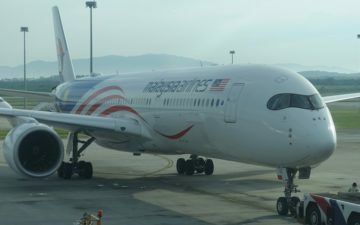 Malaysia Airlines has slowly been improving their hard and soft products with new planes, new seats and now, an improved champagne. Taittinger Comtes de Champagne 2005 in First Class (which retails for around the $110 per bottle mark). When Ben flew Malaysia Airlines A380 first class back in 2013, he was served Dom Perignon 2003, which retails for around $180 per bottle. So their first class champagne is good, but their business class champagne has been nothing special. 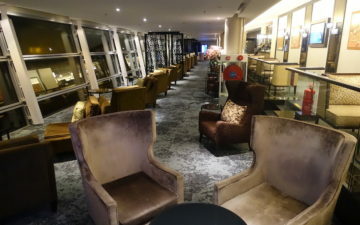 My parents flew Malaysia business class from London to Adelaide (via Kuala Lumpur) on Sunday and though they are relatively new to flying in premium cabins (I’ve finally got them into this hobby!) they were incredibly impressed with the entire experience from start to finish. 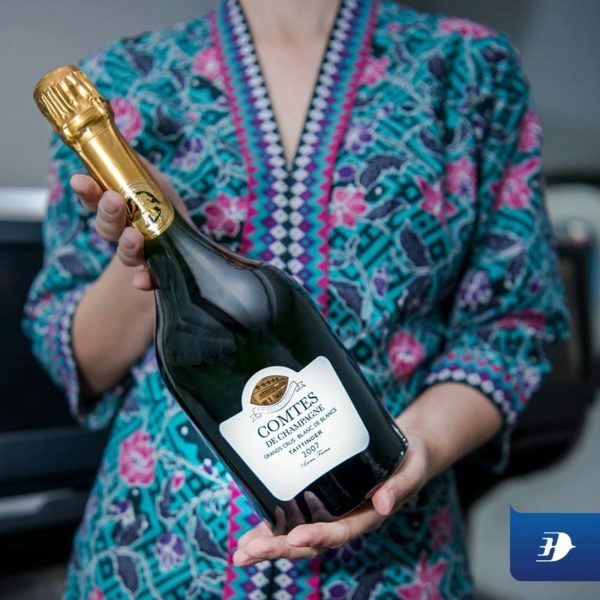 Malaysia Airlines has announced on Facebook, that for a limited time, they will serve Taittinger Comtes de Champagne 2007 in business class on all flights between Australia/New Zealand and Kuala Lumpur. This champagne retails for over $100 per bottle, so to say this is a huge step up from their current business class champagne is an understatement. I know the cost of the bottle doesn’t necessarily equate to its quality but this is an impressive move by the airline. This offer appears to run until their supplies run out. I do wonder if they will limit the number of bottles on each eligible flight, so that this vintage can be offered for a longer period? The only other airline I can think of that serves vintage champagne in business class is EVA Air, which I believe is currently serving the Veuve Clicquot La Grande Dame 2006. I’ll admit I can’t taste a massive difference between a really expensive champagne and a cheaper bottle, although I think I could tell the difference between champagne and prosecco in a blind taste test. I’ve had very expensive vintage champagne in first class numerous times, but probably prefer something like a Lanson Rose champagne myself. I do appreciate when airlines like Qatar Airways serve both a brut and a rose in business class. I do recall being served Pommery on a United flight once in business class, which tasted absolutely vile. To me, in a premium cabin it’s more about the experience, tradition and routine of sipping champagne on an aeroplane, especially during boarding, that still makes me smile even after all these years of doing it. But kudos to Malaysia Airlines for this unusual, and unexpected treat for business class passengers. What is the best business class champagne you have ever been served? I generally pay at a minimum $300USD for a bottle…..and thats just for everyday drinking. Sounds like it wasn’t at the right temperature. Their cuvées are some of the best available. Tbh..this may sound elementary but im worried abt dropping out of the sky with them. I have been searching for flights in SE Asia & come across “deals” where Malaysia was the cheapest but I passed bc of my fear of flying with them. Granted, it can happen to any airline on any day but that doesn’t help my fear. I say all that to say, I doubt I’m going to be experiencing their champagne. Paid first class here. Haters gonna hate. I don’t drink cheap champagne. I only drink the water from the toilet bowl in Emirates first class shower spa. Yeah, I share your hesitation AJ. Anyone who’ll let what ever alphabet agency that needed that plane down in the Indian Ocean do so doesn’t deserve our business. There’s literally *no way* this plane just disappeared for no reason. Even if you think everything was on the up and up, who would fly an airline that doesn’t even know where its planes are? So embarrassing. I don’t know why the airlines want to cater to the pretentious set and the would-be gourmands. All this fuss about caviar and champagne…really, most of them would just love Duc de Paris and a can of sardines/tuna…if they thought it cost mega bucks and was presented nicely. I say: serve ‘em the cheap stuff and keep ticket prices down. They were serving Roederer Cristal on JAL First class flight I took a couple of months ago and I was very impressed. One of my favorite “industrial” champagnes out there. I usually prefer small producers but those don’t and can’t cater to airlines. Why are travel bloggers so obsessed with champagne? On special occasions mom allows me one glass of sparkling wine. She always dilutes it with orange juice though. @AJ I don’t think there should be any fear at all as after a plane crash(or a plane that goes missing) they will definitely improve their safety.It should be much safer than some airlines who has not experienced plane crashes in many years. @MarkF probably because flying is one of the rare occasions they get to taste them. For bloggers and mile collectors, flying in premium cabins is a treat after dilligently raking up the points. Business travelers need the working space and the ability to sleep well above all while cash paying first class travelers most likely have better champagne in their cellar. Garuda serves some really nice 2005 vintage champagne in C, too! I don’t remember the brand – but it was very niche and amazing! Most of the premier champagnes I’ve had the fortune to have in F are way too young and not really ready to drink. Had DP -06 last summer in Emirates and the bottles I own will not be opened for another 10 years until they have matured. LPGS with BA in First *should* be the exception apart from its massive lack of backbone and character – terribly boring and overhyped. Calling this a “vintage”, while correct, is actually kind of understating it. There are lots of vintage champagnes out there for around $50 per bottle. This is also the prestige cuvee of Taittinger. And as you said, Eva and them are the only ones to serve prestige cuvees. With the dry air, pressure and the low likelihood of being served in the right temperature, it is no surprise that good/expensive champagne tastes like nothing special at 30,000 feet. Funnily enough I found Australian sparkling wine (I kid you not) to taste nicest when flying. Not quite sure why. I can certainly trump your Pommery story – AA to Sao Paulo, they served some cheap cava in first, that I only finished to keep it from spilling. Veuve Cliquot la Grande Dame 2006 on EVA Air a year ago between Toronto and Taipei in biz class. Normally I don’t drink Champagne on planes but I made an exception. US price would have been about $150. Do you need a travel partner? I don’t have a busy schedule over the next coming few months. I like a big bulging wallet…to play with.